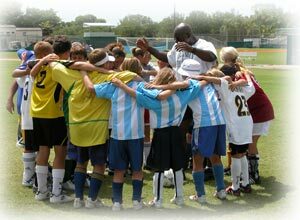 Coming Soon right here in Tampa, a soccer tradition is being started and your child can be a part of it. In just one week, our expert instructors led by Quest Soccer Camp Coordinator Donna Holyman will provide a solid footing in soccer fundamentals, giving your aspiring star the skills to help them become a better and more proficient player. The Quest Soccer Camp has emerged as South Florida's premier soccer camp, and soon that winning tradition will arrive in the Bay area. We invite you to explore the website for our Palmetto Bay camp and come to know us and experience our commitment to the soccer community.